This article appeared in symmetry on March 19, 2014. An international team of scientists from Fermilab’s Tevatron and CERN’s Large Hadron Collider has produced the world’s best value for the mass of the top quark. Scientists working on the world’s leading particle collider experiments have joined forces, combined their data and produced the first joint result from Fermilab’s Tevatron and CERN’s Large Hadron Collider. 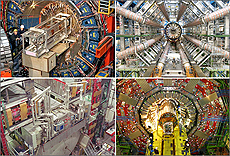 These machines are the past and current holders of the record for most powerful particle collider on Earth. Scientists from the four experiments involved—ATLAS, CDF, CMS and DZero—announced their joint findings on the mass of the top quark today at the Rencontres de Moriond international physics conference in Italy. 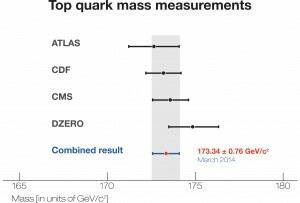 Together the four experiments pooled their data analysis power to arrive at a new world’s best value for the mass of the top quark of 173.34 ± 0.76 GeV/c2. Experiments at the LHC at the CERN laboratory in Geneva, Switzerland and the Tevatron collider at Fermilab in Illinois, USA are the only ones that have ever seen top quarks—the heaviest elementary particles ever observed. The top quark’s huge mass (more than 100 times that of the proton) makes it one of the most important tools in the physicists’ quest to understand the nature of the universe. The new precise value of the top-quark mass will allow scientists to test further the mathematical framework that describes the quantum connections between the top quark, the Higgs particle and the carrier of the electroweak force, the W boson. Theorists will explore how the new, more precise value will change predictions regarding the stability of the Higgs field and its effects on the evolution of the universe. It will also allow scientists to look for inconsistencies in the Standard Model of particle physics—searching for hints of new physics that will lead to a better understanding of the nature of the universe. 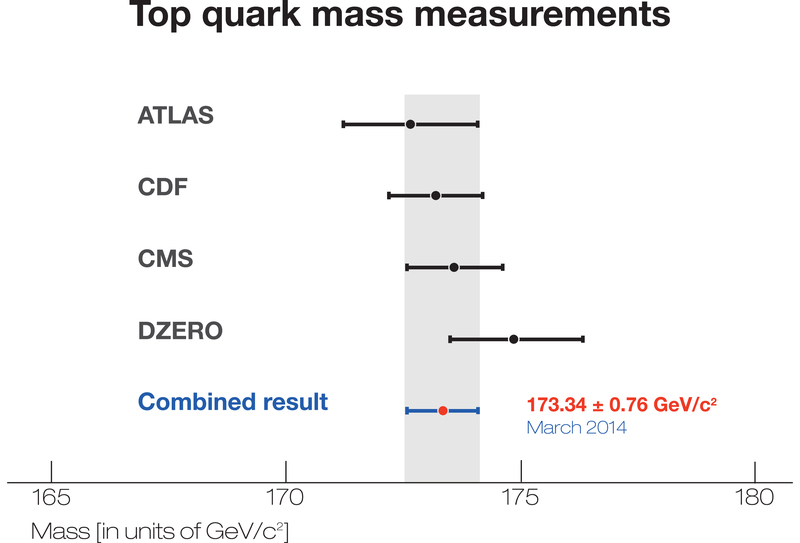 Each of the four collaborations previously released their individual top-quark mass measurements. Combining them together required close collaboration between the four experiments, understanding in detail each other’s techniques and uncertainties. Each experiment measured the top-quark mass using several different methods by analyzing different top quark decay channels, using sophisticated analysis techniques developed and improved over more than 20 years of top quark research beginning at the Tevatron and continuing at the LHC. The joint measurement has been submitted to the arXiv. A version of this article was originally issued by Fermilab and CERN as a press release.